This entry was posted in Careers & Networking, Humor, Jokes, Public Speaking, Social Dynamics. Bookmark the permalink. Would you like to break the ice, instantly engage your audience, and show your sense of humor all in one stroke? Consider using some light, self-effacing humor in your presentation. Being able to laugh at yourself is a very effective way to get an audience on your side. If you can take a joke, others will be able to relate to you, and will even root for you. It shows that you are healthily humble and can accept your own quirks. It also shows that, even though you are the one on stage, you are human – just like your audience. Rodney Dangerfield made a career out of it. It worked for former presidents Ronald Reagan and John F. Kennedy, and still works for Woody Allen and Jay Leno. It can work for you. There is a huge difference between self-effacing and self-deprecating. You want to make others laugh, not cringe. Being too hard on yourself may turn people off entirely. It will also destroy your credibility. Unless you want to be seen as a caricature, rather than a serious speaker, refrain from getting too personal or too cruel. The goal is to get people on your side, not pitying you. If it doesn’t make you laugh, it probably won’t work on them. Use this form of humor sparingly. Usually one joke is enough, unless you can bring it back in later to tie things up. 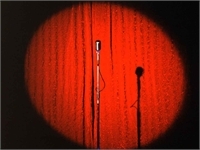 If your presentation is too heavy with jokes, it may be seen more as a standup routine or a shtick, rather than a valuable speech, and your message will be lost. Even if you have no experience with comedy, you may still effectively spice up your presentation with a quick joke or one-liner. Your delivery doesn’t have to be any different than the rest of the presentation, meaning you don’t have to over-act or do anything slapstick. Some of the funniest jokes are funny simply because they sound true at first, and then turn preposterous. Consider Woody Allen saying, “I have bad reflexes. I was once run over by a car being pushed by two guys.” It’s funny because you know it couldn’t have happened, yet he’s still laughing at himself. Perhaps the most important part of using self-effacing humor is to truly be able to laugh about what you are saying. The best lines unite people. Look for something that people can relate to and that fits the event for which you are speaking. In other words, make it light-hearted and inclusive. PowerPoint – are your slides pointing away from YOU? Networking: what does a dog have that you don’t?